This is a beguiling timeline which has won a fair bit of attention for itself. 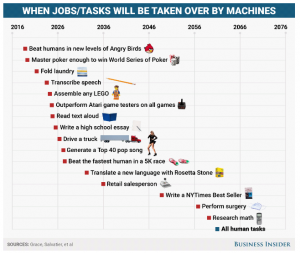 It’s challenging stuff, particularly the point around 2060 when “all human tasks” will apparently be capable of being done by machines. But drawing an apparently precise timeline such as this obscures two massive sources of uncertainty. The first is the implication that people working on artificial intelligence have expertise in predicting the future of artificial intelligence. Their track record suggests that that is far from the case: like nuclear fusion, full blown AI has been twenty years in the future for decades (and the study underlying this short article strongly implies, though without ever acknowledging, that the results are as much driven by social context as by technical precision). 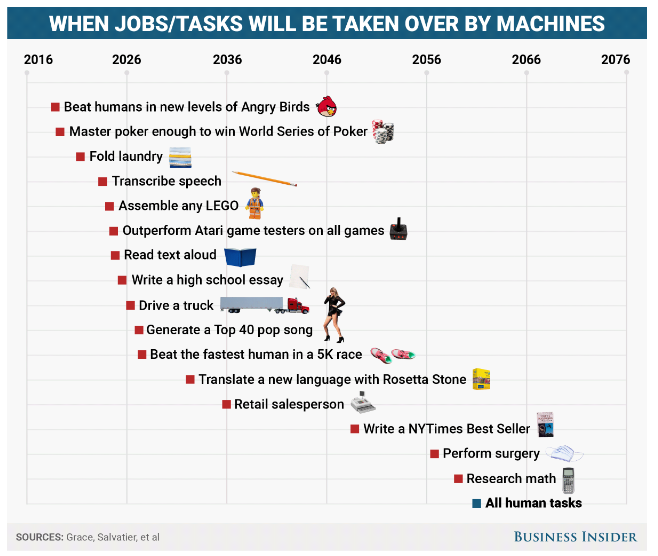 The second is the implication that the nature of human tasks has been understood, and thus that we have some idea of what the automation of all human tasks might actually mean. There are some huge issues barely understood about that (though also something of a no true Scotsman argument – something is AI until it is achieved, at which point it is merely automation). Even if the details can be challenged, though, the trend looks clear: more activities will be more automated – and that has some critical implications, regardless of whether we choose to see it as beating humans.